Yum! Summertime, picnics, barbecues... all call for a fresh and herby side salad other than potatos or macaroni. Pictured here using buckwheat and a pesto made with basil, thyme, oregano, chives, mint, parsley and walnuts. In a food processor, pulse the herbs until coarsely chopped. Add the remaining ingredients and process until an even paste is formed (can be completely pureed, but leaving it a little chunky is nice, too). Add a bit of water to reach the consistency you'd like (I added around 3 tablespoons of filtered water). Bring grain and water to a boil then simmer for 20 minutes (quinoa, buckwheat, barley) or 45 minutes (brown rice) until cooked. Fluff with a fork and let cool in a large bowl. When cool, stir in pesto until well combined. Stir in spinach, taste and adjust seasoning, and spoon into a decorative serving bowl. Garnish with fresh herb leaves and a sprinkling of walnuts. Serves 4. *NOTE: Use any fresh herbs you like, such as oregano, sage, mint, lemon balm, cilantro, parsley, sage, etc. 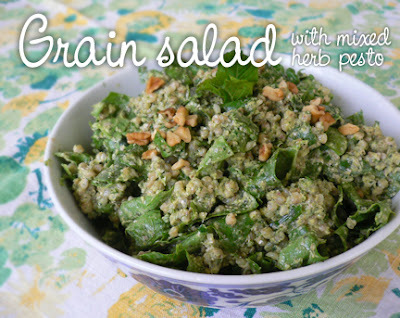 Be sure to include basil if you want that familiar pesto flavour.